Winter is hier, en so ook half-jaar vir Rietmark. Spring gou om te adverteer, en groei jou besigheid in die tweede helfte van 2016! Volg die voorbeeld van Helen Weigall van Cakes & Things - al vir baie jare 'n lojale Rietmark adverteerder. Met die blootstelling wat sy kry, kan sy as pensioenaris haar inkomste aanvul deur te doen waarvoor sy nog altyd lief is - om oud en jonk te verras met spesiale koeke vir alle geleenthede. Kontak Helen vir bestellings by 012 331 0944 of weigallcakes@yahoo.com. "My advertensie in Rietmark gaan al baie jare terug en ek wil graag die Rietmark personeel bedank vir die betroubare inligting en advertensies wat elke maand in Rietmark verskyn. Ek adverteer net in Rietmark en DIT WERK VIR MY!". "I am Helen and I advertise in Rietmark - it has always worked for me. I am a pensioner working from home doing what I have always done to the best of my ability - baking cakes and nothing makes me happier than seeing the smiles of children when they see their birthday or celebration cake. I started baking in 1974 and am mainly self-taught. My motto is to supply freshly baked cakes and cupcakes and not to use frozen cakes Even though ingredients have become more pricey I do my utmost to keep costs to a minimum. For that reason I do not employ staff but work alone, even if it means working through the night. I am always open to ideas and improving myself and can be contacted at any time". 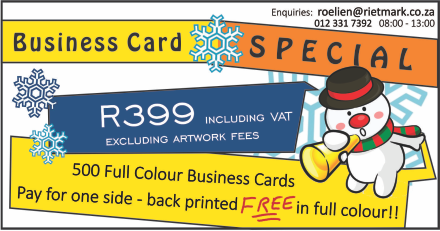 Make Rietmark your Number 1 supplier of flyers and business cards - contact us for quotes! Customers will reward good quality and service with brand loyalty. Therefore firms must give customers what they want, to cultivate a loyal customer base. The idea that the customer determines how successful a business becomes has been accepted by numerous entrepreneurs and management experts since the late 19th century. Logically, if customers are happy with a product or service they will make repeat purchases and give recommendations to their friends and family. This helps the business to grow, and in effect pays the wages of the staff. The process involved in building passion and trust between the two parties requires not just creativity on the part of the business to promote an emotional connection with the customer, but also practical know-how to ensure streamlined production and distribution systems. These practical aspects include such things as: order cycle time; availability of products; flexibility of delivery times; the look of the packaging and the ease of opening it; the simplicity of the returns process; and the accessibility of customer service personnel to deal with problems or queries. 1. Shred the cooked chicken breast and mix through with mayonaisse, spring onions and seasoning. 2. Spoon the chicken and mayo on top of the toast, top with a slice of cheddar and mozzarella. 3. Grill in the oven until the cheese are melted and bubbly. 4. Serve with fresh parsley and seasoning. Exceed your customers' expectations. If you do, they'll come back over and over. The customer can fire you by simply deciding to do business elsewhere. The vital force in business life is the honest desire to serve. Business, it is said, is the science of service. He profits most who serves best. Level 4 contributor to BEE and 100% procurement partner.